"These are delicious tropical tasting cookies. I took fourth place in the Land O'Lakes National Butter cookie contest at the L.A. Fair for these. Enjoy!!!" Sift together the flour, salt, and baking soda, set aside. In a large bowl, cream together the butter and brown sugar. Stir in the eggs, pina colada oil, and rum extract, mix well. Stir in the dry ingredients until just combined. Using a large wooden spoon, stir in the drained pineapple, coconut, white chocolate chips, and nuts. Cover bowl, and refrigerate for 1 to 2 hours, until firm. Roll dough into golf ball sized balls, place 2 1/2 inches apart onto the prepared cookie sheets. Bake for 15 to 20 minutes in the preheated oven, until golden brown. Remove from baking sheets to cool on wire racks. My Mother made these cookies for a Hawaiian theme party and everyone raved about them. 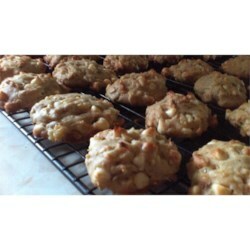 These cookies are moist and delicious and really make you think of the tropics. Overall, they were pretty good, but a little bland. I dusted them with powdered sugar once they were cooled and that sweetened them up just enough. Very nice! Kind of lacking an overall sweetness, and are very cake like with not that much crunch. A little vanilla and coconut rum icing drizzled on top maybe, and less flour and more egg in the cookie. Eww. Im sorry but this recipe was just nasty!